Let's face it, plants promote a healthy lifestyle. 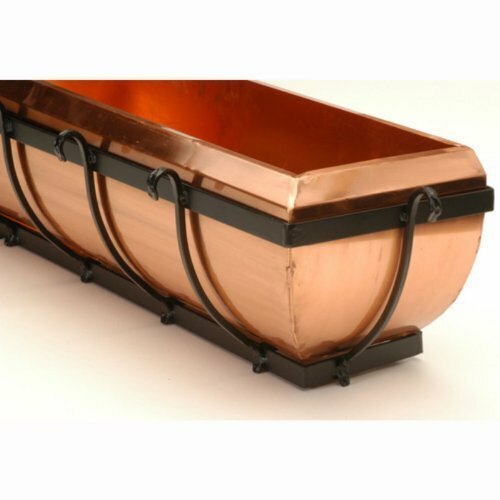 Add a little flair to your outdoor décor with a stylish copper planter box from H Potter. HEAVY & DURABLE CONSTRUCTION - Each rectangular window box liner is hand-crafted from 100% real raw copper and finished with a clear-coat lacquer. Thick iron is welded into a sturdy frame and finished with a classic black, powder-coated, protective finish. Drainage holes in liner provide excellent drainage for your copper window box. REAL RAW COPPER - Raw materials are a favorites among architects, custom homebuilders, restaurants and hotels. The contrast of the raw copper with the black powder-coated metal make this window box luxury outdoor décor. Copper also naturally enriches the soil with nutrients. OUTDOOR WINDOW BOX PLANTER - Liner is 48 inches wide by 8 inches tall by 8 inches wide, this large size window planter will make a dramatic statement wherever it's placed. Unique and sturdy, it's flat on the back side to sit flush against the mounting surface. If you're looking for something different, this is a window box your neighbors will envy. Thinking minimalistic, fill your H Potter window box with succulent plants or flowers in pots or urns to create simplistic curb appeal. SECURELY PACKAGED AND BUILT TO LAST - A decorative way to display your favorite blooms outdoors, the 48 inch window box planter will add a natural warmth to your outdoor décor. It has a wide mouth top, which lets the plants breathe and grow properly. Sturdy yet lightweight - brackets make removal easy for planting and care for everyone from gardeners to landscapers to designers.